This is a review of a 2017 North Dakota State University Beef Report article titled Moderate nutrient restriction influences expression of genes impacting production efficiencies of beef cattle in fetal liver, muscle and cerebrum by day 50 of gestation. This article is summarized by Aaron Berger, Nebraska Extension Educator. Research continues to demonstrate the impact of maternal nutrition on the developing fetus in beef cattle. 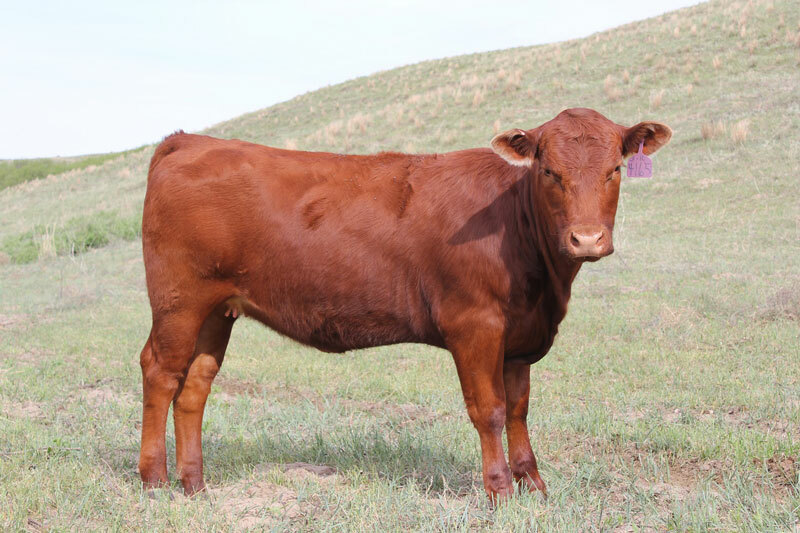 A recent study at North Dakota State University with yearling beef heifers in early pregnancy examined and compared two groups of heifers that were managed the same prior to breeding, but after breeding were assigned to different levels of nutrition. Heifers in this study were estrus synchronized and bred via artificial insemination. Immediately after heifers were bred, they were randomly assigned to one of two diets for 50 days. The first diet was a total mixed ration that was projected to provide nutrition at a level that would result in approximately 1 pound/day gain. The second diet was the same ration, only it was fed at 60% of the first diet which resulted in a moderate nutrient restriction. A total of 14 heifers were used in the study with seven heifers being assigned to each diet. The seven heifers fed the first diet gained 1.12 pounds on average per day over the 50 day trial. The seven heifers fed the second diet which was moderately restrictive lost on average 0.18 pounds per day over the 50 day trial. On day 50 of gestation for all of the heifers, an ovariohysterectomy procedure was conducted. Through this process, the fetal liver, muscle from the hind limb and cerebrum tissue was collected. Ribonucleic acid (RNA) was extracted and RNA-seq analysis was conducted to determine differences in expression of genes. For the fetal liver, muscle and cerebrum, a total of 548, 317 and 151 genes were identified as being differentially expressed between the two groups of heifers. This study shows that the nutritional status of beef heifers in the very earliest stages of pregnancy impacts how genes are expressed in their developing fetus. What isn’t known is how this change in gene expression would impact the developing fetus as a calf throughout its life. Future research into the impact of nutrient status of dams in early stages of pregnancy on fetal development may provide producers with information to help them make strategic nutrition management decisions. Research may also provide insight into the impact of events such as drought on gene expression in cattle developing and growing in utero when such events occur. Authors of the NDSU Beef Report article are as follows: Matthew S. Crouse1, Joel S. Caton1, Robert A. Cushman2, Kyle J. McLean1,3, Carl R. Dahlen1, Pawel P. Borowicz1, Lawrence P. Reynolds1 and Alison K. Ward1. 2U.S. Department of Agriculture, Agricultural Research Service, U.S. Meat Animal Research Center, Clay Center, Neb.